The movies written, directed, and produced by John Hughes have a complex legacy. They are beloved and reviled by many and I can understand both reactions. First, the criticisms. Yes, the Hughes films oftentimes portray a one-dimensional view of adolescence, primarily showing teenagers as misunderstood lost souls in a world of uncaring and/or buffoonish adults. Yes, the Hughes films almost exclusively show a white (allegedly) middle-class view of the world. Yes, the Hughes films seem to exaggerate class and social differences in high school to increase the drama of his stories. And lastly, the Hughes films are sometimes too cute and cleverly written, giving adolescents an idealized world where they are smarter and funnier than all of the grown-ups around them. Now, for the good stuff. It’s clear Hughes truly liked his teen characters, took them seriously, and most importantly, treated their concerns with the same gravity that teens often took them. Just because most of us have had life experiences that help us take life’s disappointments and setbacks in stride, we often forget how such setbacks can seem like the end of the world to a young person. It’s this sensitivity that still makes Hughes’s films resonate today and why many of them still hold up. They certainly hold up much better than the self-conscious “Heathers,” which comes off as someone trying too hard to make an anti-Hughes film. Susanna Gora’s “You Couldn’t Ignore Me If You Tried” is an in-depth look about the making of Hughes’s most iconic teen films (“Sixteen Candles,” “The Breakfast Club,” “Pretty in Pink,” “Ferris Bueller’s Day Off,” ” Some Kind of Wonderful”), but also looks at a couple other Brat Pack films (“St. Elmo’s Fire,” “Say Anything”) and even includes a chapter on the impact of the music of these films, as well as the fallout of David Blum’s infamous “New York” magazine article that coined the phrase “brat pack.” There’s also extensive interviews with cast members, fellow writers/directors, studio executives, and others who were part of the creative process that brought these films to the screen. Even if you dislike some or all of the films, Gora’s book is a terrific analysis of an era of American film that’s too often dismissed. 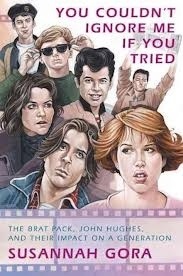 This entry was posted in Books, Comedy, Film and tagged anthony michael hall, brat pack, bratpack, john hughes, molly ringwald, susannah gora, you couldn't ignore me if you tried by Dave's Strange World. Bookmark the permalink.